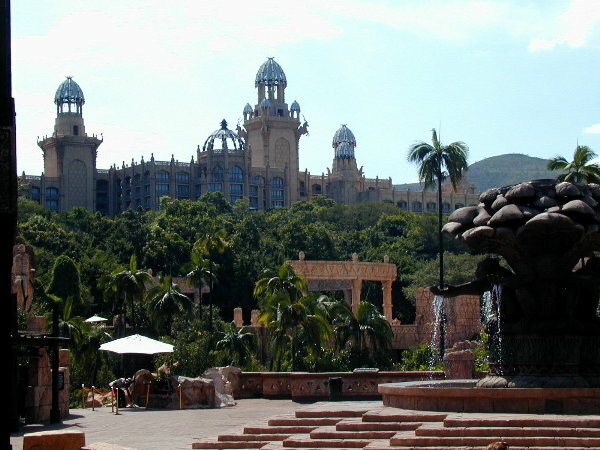 We chose to spend 3 days in Sun City because we heard it was a mini-Las Vegas oasis and is a great place to just hang out in luxury. We figured we would be under no pressure to see any tourist sites or do anything except sit by the pool. Well, we would say it is more a combination of the outlandish decorative spending of Las Vegas (but no where near the level) and the attractions of a Disney World (no where near the size). Basically, it is five hotels, a man-made lake, full size and mini golf course, crocodile farm, wave pool and man-made beach, huge water slide, numerous pools, animal farm, walking trails, entertainment center, casino, and lots of statues/lagoons in a large valley in the middle of nowhere. We visited during the week to avoid the massive crowds that supposedly visit the resort on weekends so we felt like we had the place to ourselves. 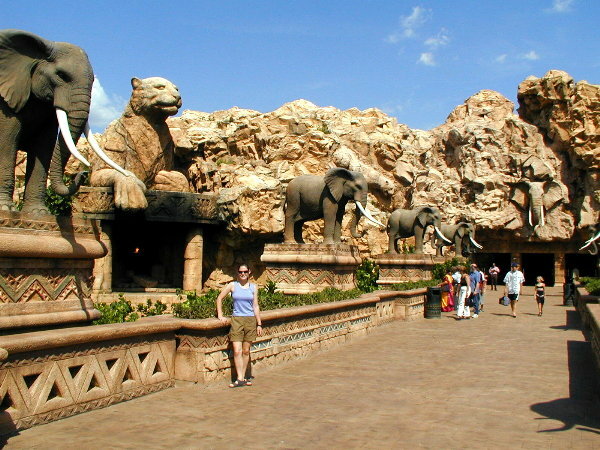 We concluded that Sun City, though quite cheesy, would be a great place to visit with kids the right age to enjoy it. Based on many recommendations we stayed at the Palace Hotel, which is considered the nicest of the five hotels. It was quite large and had a great pool and restaurants, but was the farthest from the entertainment center and casino. We could not believe the number of people the place employed -- there might have been more employees than guests. There was plenty of room at the pool and restaurants since we were there on weekdays. The room was nice and had the most complex interactive TV/internet system we had ever seen -- we doubt that many guests ever use it. But we thought the minor luxuries were overlooked such as having a list of TV channels or a list of important phone numbers or listed price of phone calls. The money was spent on the millions of floor inlaid mosaics and the royally painted ceilings and marble structures. We spent the whole first day relaxing by the enormous Palace pool trying to even out our farmer's tans. We put on sunscreen and were careful to not stay in the sun too long before allowing the many pool attendants to erect an umbrella for us. Of course, we were not perfect on our sunscreen application and got pretty burned in funny spots. Therefore we could not go to the pool anymore on this trip. 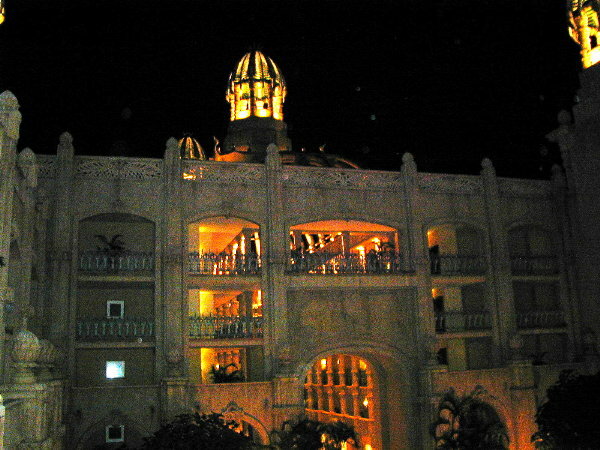 A view of the Sun City Palace Hotel from the entertainment center. Panoramic of the Palace pool where we got sunburned. It is hard to tell from this picture, but the enormous pool is about 100x50m in size. We stayed in the 'elephant' wing of the Palace Hotel. This is a view of the courtyard from our room at night. There are many of these courtyards in the Palace. Kristen standing on the bridge to the entertainment center. Note the cheesy statues everywhere. The large wave pool and man-made beach. 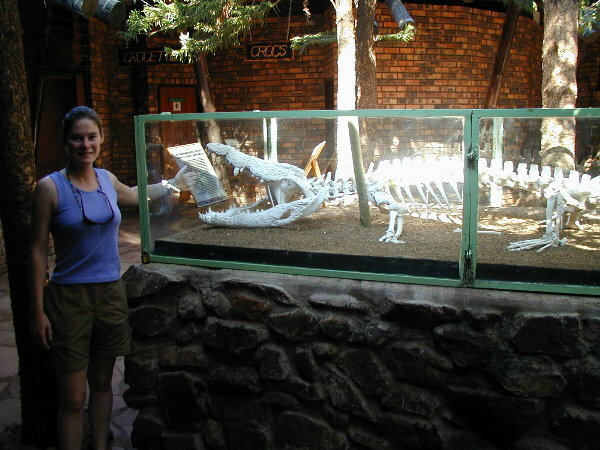 Kristen, in the crocodile farm, standing next to the skeleton of '3 step', the 100+ old crocodile that died from an infection last year. 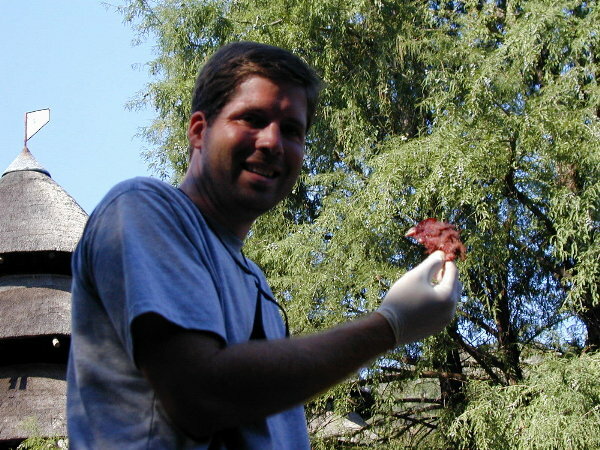 Dan displaying the smelly, bloody, chicken head that we used to feed the crocodiles. 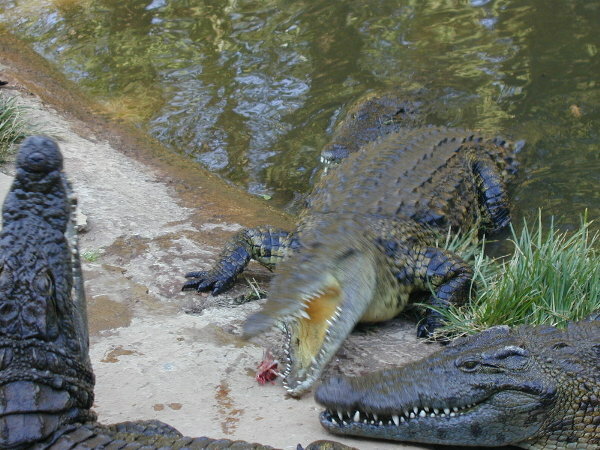 Action shot of a crocodilec going for the meat. The crocodiles fighting over the next bit of food. 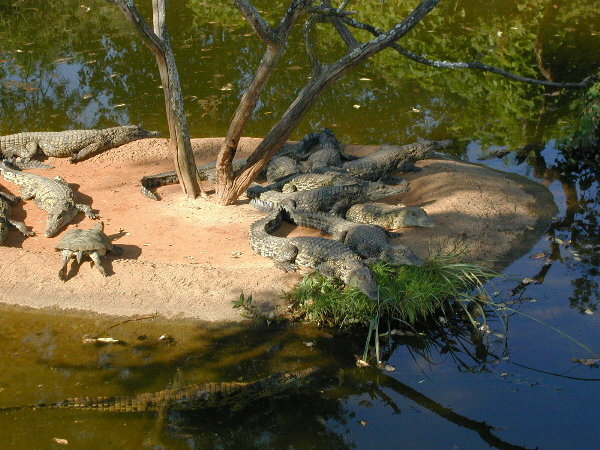 An island where the baby crocodiles are held. 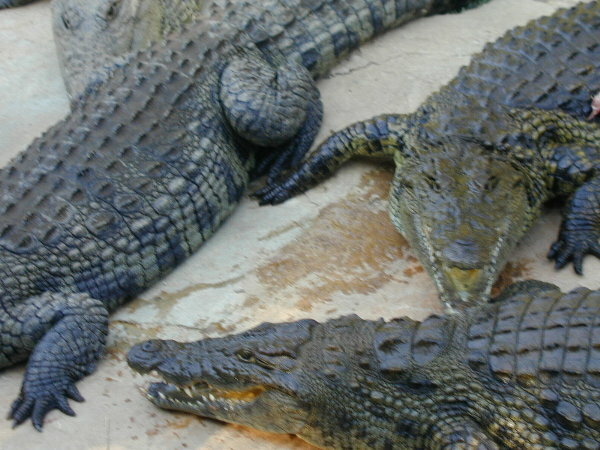 It is hard to tell from this picture, but these crocodiles are only about 2 ft. The many shops and restaurants in the entertainment center were empty, but of course still open with full staff. We went to the casino and gambled a little bit. They had an interesting twist on Black Jack called Diamond Rush -- if you bet an additional R$5 (~US75¢) on a hand and drew three diamond 7's then you won R$350,000, or less if you drew non-diamond 7's. Since we had drawn three 7's a few times in the Quito casino, we bet the R$5 on each hand. On one hand Dan had two 7's (not diamonds, unfortunately) -- before dealing the next cards they called over the pit boss and some other casino hosts to watch. Kristen was on Dan's right and we could not decide if she should take a hit or let Dan have the next card. Dan suggested that it might be a 7 and we would be mad if she got it and not him. So she passed and it was a 7, to make 3 7's! They played loud music, rang bells, made intercom announcements , and gave us a Diamond Rush hat. Unfortunately, the payout for 3 non-diamond 7's was only 500 rand which was less than we probably spent on the R$5 bets, but it was fun anyway. We also visited the crocodile farm where they claim to have the 3 largest Nile crocodiles in captivity in the world. For R$10 they gave us a plastic bag of bloody smelly chicken heads so that we could feed the crocodiles. We did not know the farm was so large -- we used all our chicken heads before we reached either the biggest or the smallest crocs! We walked around a while and were amazed at the number of crocodiles they had. We were able to see over to a non-display area where there must have been thousands of adult crocodiles. Unfortunately, there was no one around to explain to us why there were so many or what they did with them. We flew the 60 minute flight from Hoedspruit airport (Ngala Safari) to Sun City airport on a 30 person prop. It was all very easy travel. (+27 14) 557-3000 A bit outlandish, but the nicest of the 5 hotels. Probably not worth the extra cost, though. The Sun City Hotel seemed as nice and closer to everything. Comments/Questions about this page? Please email us!